Another Friday, another snowy and frigid day! I hope to make it back to Orphans of the Storm® next week so we can all meet more pooches! Until then, here is another interview with Keith, who adopted Max A Pooch from the shelter. I wrote about Keith and Max A Pooch in an earlier post, but here are more details about the great story of these two best friends! A: One day wife Helen and granddaughter Zoe went to Orphans of the Storm® to adopt a cat for Zoe. Besides dogs, Orphans has many incredible cats. If you can’t find a tabby or two or three or four at Orphans, you will never find a cat anywhere. While Helen and Zoe were looking at all the cats I decided to take a look at the dogs. I saw this poor dejected and scared black Lab. Helen and I had been talking about getting a dog. So I walked back to where she and Zoe were with the cats and said, “You should see that dog in kennel 25.” She took one look at him and we had ourselves a new companion. A: I live in Deerfield. Orphans has such a presence in the area that I don’t remember when I wasn’t aware of them. Q: Was Max your first pet dog? A: No, my first pet dog was a small beagle named Mitsy when I was around seven or eight. Mitsy was an amazing dog. One summer we went on vacation and a friend of my parents watched her. When we came home from vacation we learned Mitsy had slipped out an open door and was lost. I was dejected. She was twenty-five miles from home. Over a month later I looked out my bedroom window one morning, and there was Mitsy on the our front lawn. How she ever found her way home is a miracle. Since then I have had mutts, beagles, bassets, and poodles, and now Max. I am Keith, the sidekick of Max A Pooch. Max is a proud alum of Orphans. He turned five the day after Christmas. We adopted Max when he was four months. Max was relinquished by his owners to Waukegan Animal control and Orphans recycled (rescued) him. He was a high-energy project when we first met. We think he spent most of his first months in a basement. Why? When we brought Max home, he was terrified of going to the basement. He knew absolutely no commands and all he wanted to do was run, run, run, run, run. But he soon showed us what a smart boy he is. That’s him below, don’t you think he looks so wise? 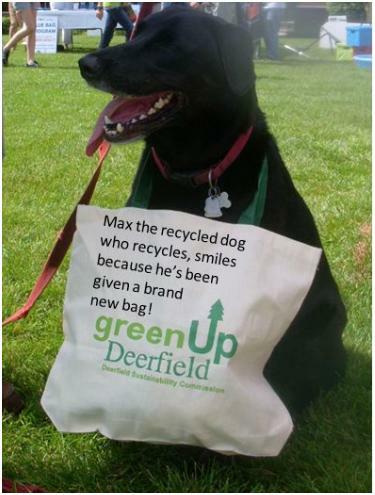 Now Max is known far and wide as the recycled Lab who finds and recycles Litter. To see exactly what that means just take a look at this 14 second video . 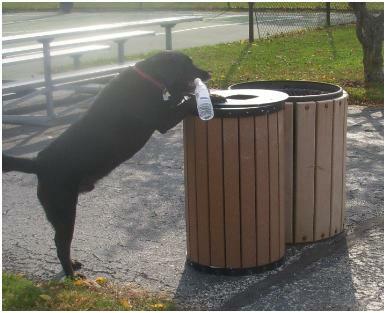 Max proves picking up litter and putting it in its place is so easy even A Pooch can do it. Max believes that in addition to not littering you should pick up litter when you have a chance. Litter is unsightly, it pollutes our waterways, and it can kill, maim, or harm wildlife and pets. He loves to appear with me in front of audiences and demonstrate not only can he pick up and deposit litter, but he can seek it out. He also can show humans where to deposit litter and trash. Max A Pooch first appeared at the Orphans of the Storm® Pooch Parade last summer. Even though it rained hard, he still put on a demonstration and even got his picture on the front page of the Deerfield Review. We have appeared on radio and TV. Max A Pooch was featured by Lake County as part of their Lake County Green Initiative, as well as on AOL Patch, the Huff Post website, and many more places. Max A Pooch is just one example of the incredible dogs and cats that are saved by Orphans of the Storm each year and adopted by people like me. We think that people who abandon pets and those who litter have much in common. Both types of people leave their messes and problems behind for the rest of us to take care of. The result is American spends $52 billion dollars a year cleaning up litter and euthanizes more than 4,000,000 cats and dogs annually. Max could have been a pooch that was put down along with millons of other pooches. Thanks to Orphans, he is Max A Pooch, the canine with a mission and a message. Learn all about Max A Pooch at his website, or go to his pressroom page. Posted by Meet the Pooches on January 20, 2012 in Interview and tagged adoption, animal shelter, Chicago, dogs, Labrador Retriever, Orphans of the Storm, pets.